Miguel and I struck up a close relationship, one that was to endure for a decade and a half until his death in 1981. What particularly impressed me about him on our first meeting was his undoubted strength of character — forged by his experiences in the Resistance as an urban guerrilla and ‘falsificador’, and in Franco’s prisons — and the extraordinary quality of his spoken English, a language he had acquired entirely from English-speaking prisoners. 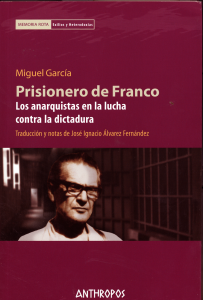 No other political prisoners I came across during my three years imprisonment in Franco’s jails had Miguel’s mastery of language, or his skills as a communicator. Our conversations centred on how to expose the repressive nature of the Francoist regime and raise the profile of Franco’s political prisoners in the international media, something I was in a position to do given my relatively privileged position as a foreign political prisoner and the access I had to the outside world through my by then extensive network of friendly functionaries in Carabanchel itself. In 1967, following receipt of a personal pardon from Franco, I was released from prison and, on my return to Great Britain, I became involved with the resuscitated Anarchist Black Cross, an anarchist prisoners’ aid organisation. The focus of our activities was international, but Franco’s prisoners were, naturally, because of my history and the continuing and intensifying repression in Spain, top of our agenda. The case of Miguel Garcia Garcia, one of the Anarchist Black Cross’s most prominent correspondents, was one that we regularly pursued with the international press and through diplomatic channels. Released in 1969, after serving twenty years of a thirty-year sentence (commuted from death), Miguel came to live with me in London. It took him a little time to acclimatise to the profound social and technological changes that had taken place in the world since his arrest as a young man in the Barcelona of 1949, changes that were even more profound in the ‘tolerant’ and ‘permissive’ London society of 1969. In fact, so great was the trauma that he literally was unable to speak for some months. The shock of his release had triggered a paralysis in some of the muscles in his throat, and, through Octavio Alberola then living under effective house arrest in Liège, we arranged for him to see a consultant in Belgium about his condition. The time with Octavio was well-spent and brought him up-to-date with what was happening within the European movement and the role of the International Revolutionary Solidarity Movement, which operated under the banner of the Grupo Primero de Mayo, a continuation of the clandestine anarchist Defensa Interior (DI), which had been tasked with the assassination of Franco. The First of May Group had recently emerged from the sabotaged (by Germinal Esgleas and Vicente Llansola) ruins of Defensa Interior (DI) as an international, anti-capitalist, anti-imperialist revolutionary organisation, structured to carry out spectacular direct actions. It took its name from the first operation carried out on 1 May 1966 when members of the group kidnapped the ecclesiastic adviser to the Spanish Embassy to the Vatican, Monsignor Marcos Ussia. Soon the group began taking in a much broader area of attack targeting, in particular, the US and European governments for their complicity in the imperialist war in Vietnam. BACK IN London, mainly with the moral and financial support of comrade Albert Meltzer, my co-editor of Black Flag and the driving force behind the revived Anarchist Black Cross (ABC), Miguel entered into a dynamic new phase of his life as the International Secretary of the ABC and a pivotal figure in the libertarian resistance to the Franco regime. With Albert he embarked on lengthy speaking tours of England, Scotland, Wales, Northern Ireland, West and East Germany, France, Belgium, Denmark and Italy, talking to a new generation of radicalised young Europeans about anarchism, international solidarity and, of course, the need to confront tyranny with practical cooperation and direct action. It could be said that the result of one of Miguel’s early talks — in a crowded meeting room at the offices of Freedom Press in London’s Whitechapel High Street in February 1970, shortly after his arrival in Britain — was to give rise to the so-called Angry Brigade, Britain’s first urban guerrilla group. Miguel’s voice was still weak so I had to do much of the talking for him, but as the evening wore on and the story of his adventures and deprivations at the hands of the Francoist authorities unfolded, that and the fact that his revolutionary spirit and determination remained clearly undiminished, it was clear he had made a deep emotional impression on the fifty or so young people in the audience. Here, in front of them, in person, was someone who had been in direct confrontation with a fascist state, who had been totally involved in resistance struggles, and who had paid a heavy penalty. Nor was it a purely historical struggle. Franco remained in power and a new internationally coordinated anarchist action group, the First of May Group, was carrying on that struggle. At Freedom Press that February night in 1970, the significance, the importance of the First of May Group, and the tradition it — and Miguel — sprang from, was not lost on the people crammed into the small room to hear Miguel Garcia’s story. Among those present were some of the core activists later convicted in the historic ‘Angry Brigade’ trial: John Barker, Hilary Creek, Jim Greenfield and Anna Mendelson. Miguel’s flat in Upper Tollington Park, near North London’s Finsbury Park, soon drew visiting anarchists from all over the world. It also began to attract police attention once Miguel launched (with Albert’s help) the Centro Ibérico and International Libertarian Centre in London, a cosmopolitan venue that became a magnet for anarchists everywhere; it had been many years since there was such a thing as an international anarchist club in London, and its success was entirely due to Miguel’s powerful personality. In 1971 the Centro Ibérico moved to a large basement in Haverstock Hill to which came many extraordinary people, including survivors from innumerable political upheavals. Visitors included the Spanish militant and historian José Peirats and Emilienne Durruti, partner of Buenaventura Durruti. Another regular at the Centro Ibérico was ETA leader Pedro Ignacio Pérez Beotegui, also known as ‘Wilson’, who was involved in the planning of the December 1973 assassination of Franco’s protégé and deputy, prime Minister Carrero Blanco. The new Centro was entirely Miguel’s creation and he spent his whole time nurturing it, cutting himself off from any paid employment, even though he was well past what should have been retiring age anyway. Through Albert, however, he did extract a small pension from the British government. Phil Ruff, the Black Flag cartoonist who shared Miguel’s Upper Tollington Park flat after Albert moved to Lewisham, remembers accompanying Miguel on endless trips from Finsbury Park to Haverstock Hill, almost every night throughout the 1970s, to open up the Centro so that someone would be there if anyone dropped in. Often it was just Phil and Miguel looking at the paint peel off the walls and having a drink, but if someone did drop by Miguel would immediately make them welcome, cook up a paella, and start weaving his magic. He was without doubt a great communicator and would have made a wonderful hostage negotiator. Everybody left the Centro feeling they were Miguel’s best friend, and ready to slay dragons. He had a way of making you think that. He turned the basement into an internationally known place to go if you needed help in London; somewhere to find a welcome, food, a bed for the night, or a place to squat. He also brought people together from all over the world, becoming the birthplace for many affinity groups that were active in Central and South America, and Europe. In 1970-71 Albert was working in Fleet Street as a telephone reporter/copy-taker for The Daily Sketch, a right-wing British national tabloid newspaper, and after much discussion and argument — and believe me Miguel could be extremely argumentative and pugnacious — Albert finally convinced Miguel to write his memoirs. And so it was that the typescript of what was to become Franco’s Prisoner was hammered out between Miguel and Albert and typed up in a disused back room of one of Britain’s foremost Conservative populist newspapers — and paid for on the time of Associated Newspapers. The book, Franco’s Prisoner, was published in 1972 by the Rupert Hart-Davis publishing house, which had originally commissioned my book The Christie File, but reneged on the contract at the last moment because of the allegedly contentious nature of the material. As well as providing wide-ranging advice from abortion to legal aid to squatting, Miguel played a key role in many of the international defence campaigns run by the International Anarchist Black Cross at the time, including those of Julian Millan Hernandez and Salvador Puig Antich in Spain, and Noel and Marie Murray, two members of the Dublin Anarchist Group sentenced to death in Ireland for their alleged part in killing an off-duty Garda officer during a bank robbery in Dublin, in 1975. Salvador Puig Antich had been a regular visitor who accompanied Albert and Miguel on some of their speaking tours around Britain. Returning to France in August 1973 to take part in a conference of young activists to set up the anarchist defence group known as the MIL (Movimiento Ibérico de Liberación), Salvador Puig Antich was involved a series of spectacular bank expropriations across Catalonia and Southern France. In September 1973, however, Puig Antich walked into a police ambush in Barcelona’s Calle Gerona in which he was wounded and a Francoist policeman was shot dead. Puig Antich, 25, was garrotted in Barcelona’s Modelo prison on 2 March 1974. After the military coup in Argentina on 24 March 1976, Miguel persuaded a lot of people to ‘lose’ their passports so that comrades fleeing to escape the Junta could adopt a temporary identity change. In June 1976 he installed a printing press in the basement at Upper Tollington Park, on which he printed a number of anarchist books in Spanish, including Anarquismo y Lucha de Clases (the Spanish translation of Floodgates of Anarchy, written by Albert Meltzer and myself) that he distributed in Spain. As well as printing identity documents, he also got together a group of young Spanish comrades in London to produce their own anarchist paper Colectivo Anarquista. In the late 1970s Miguel returned to his native Barcelona where, funded by the Spanish writer and former diplomat José Martin-Artajo, anarchist son of Franco’s foreign minister Alberto Martin-Artajo, he fulfilled one of his life’s ambitions – to open his own bar. La Fragua, a former forge at No 15 Carrer de la Cadena in Barcelona’s Raval District — not far from where pistoleros working for the Catalan employers’ organisation gunned down the noted CNT leader Salvador Segui and his friend Frances Comes in 1923 — opened for business in 1979. As with the Centro Ibérico, La Fragua became a Mecca for anarchists and libertarians from all over the world, and an important meeting place for the anarchist activist groups of the so-called ‘Apache sector’ centred around Luis Andrés Edo in Barcelona. Miguel’s humanity was the most characteristic thing about him, that and his tenacity and ability to persevere and survive despite all odds. He was, without doubt, a pretty significant figure to the generation radicalised in the late 1960s and 1970s. Miguel had gone to prison fighting – and that was how he came out. He was untouched by the years of squabbling and in-fighting that characterised the life of the Spanish Libertarian Movement in exile. Miguel’s answer for any dire situation was always the same – ‘we must DO something!” His work with the Black Cross — providing practical aid to libertarian prisoners all over the world and making solidarity an effective springboard to militant action — influenced a new generation of anarchists not just in Spain but in many other parts of the world including Britain, France, Belgium, Italy and West Germany. I was living on the northern island of Sanday, in Orkney, for much of the time Miguel was in Barcelona, but we met whenever we could. In 1980, Brenda, my partner, went to work with him at La Fragua for six months, at his invitation, to help improve the bar’s menu. Miguel’s culinary skills, acquired in Franco’s prisons during times of great austerity, left much to be desired! It was on Sanday, one December evening in 1981, that I received an unexpected telephone call from Miguel who was back in London, in a nursing home, being treated for advanced TB. It was nice to hear from him and we chatted about this and that, but nothing in particular, and for that reason alone it was strange. Usually, when Miguel rang it was to arrange to do something or get something done. But on this occasion it was simply to talk, nothing else. He also spoke with Brenda, again about nothing in particular, and she promised to write him one of her long chatty letters the following day, which she did. Unfortunately, Miguel never received it. He died in the early hours of the following morning. 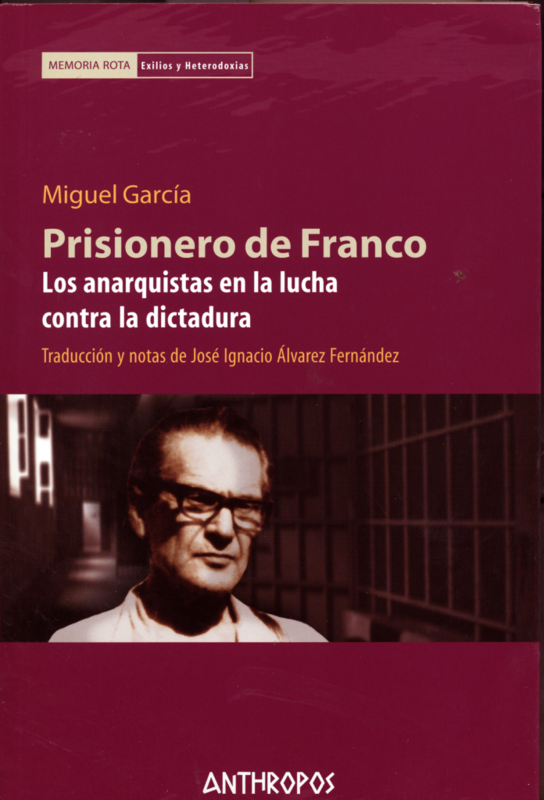 Miguel García García’s life is a good pointer to what anarchism is in practice. Not a theory handed down by ‘men of ideas’, nor an ideological strategy, but the self-activity of ordinary people taking action in any way they can, in equality with others, to free up the social relationships that constitute our lives. Miguel García García may have lived a hard life, but it was a worthwhile life, and he was an inspiration to us all. Miguel García García, fallecido en Londres en 1981, forma parte de una generación excepcional de combatientes que dedicaron su vida a luchar contra el fascismo y a lograr una sociedad más justa y libre. Este testimonio, apareció en Inglaterra en 1972 bajo el título de Franco’s Prisoner. En él García rememora sus años de lucha durante la guerra civil, su internamiento en diferentes campos de concentración, y su participación en la resistencia antifranquista formando parte del grupo Talión, por el que será condenado a la pena de muerte en 1952 y que posteriormente le fue conmutada. El horror y la brutalidad del universo totalitario franquista que aparece retratado en este libro nos confronta con el destino de los perdedores, de los vencidos, y con la disyuntiva de cómo sobrevivir y mantener viva la esperanza después de una derrota que supuso el fin del sueño igualitario.